Another spur of the moment wine dinner with my friend Gerry who lives in Oaks, PA led us once again to downtown Phoenixville. Tonight it was Marly’s. This area reminds me so much of Collingswood NJ with the main difference being Phoenixville probably has more dining spots except fewer of them are BYOB’s. Having said that, there are still enough to visit several times without having to repeat any of them. 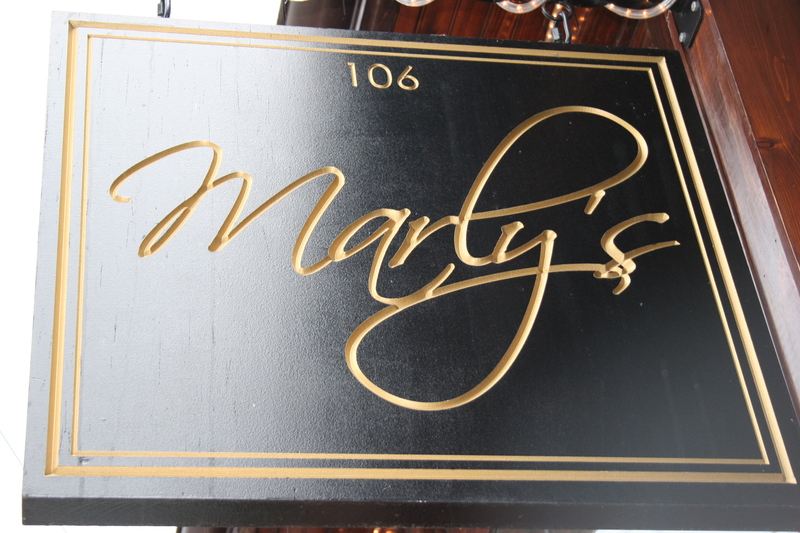 As this was a Tuesday evening and lots of places were closed, we were happy to see Marly’s open. We virtually had the place to ourselves which was nice for us but not so good for the owners. It was also a bit unfair as the food here certainly deserves to have more people enjoying it. I’m sure they do well on weekends but it’s often those midweek customers who keep a place going. We can never be 100% certain we will find good food but dining with Gerry always means there will be some good wine. Tonight he brought the 2007 Stefania, Santa Cruz Mountains, Cabernet Sauvignon. This is the best of a stellar Stefania lineup and offers a nose of ripe plums, red fruit and a hint of menthol The tannins are smooth and the finish lingering. My contribution was a 2006 Reverie, Diamond Mountain, Cabernet Sauvignon, Napa Valley. This one edged out the Stefania. I thought it was close but Gerry thought this one was decidedly better over time. It was very smooth with some bright berry fruit and licorice with subtle smokiness. Both wines went well with our entrees. Gerry passed on appetizers and had the Caesar Salad as a starter. he thought it was crisp, fresh and well-made. I have no idea what I was thinking when I ordered the Watermelon Gespacho. Maybe I envisioned liquid watermelon in a bowl. 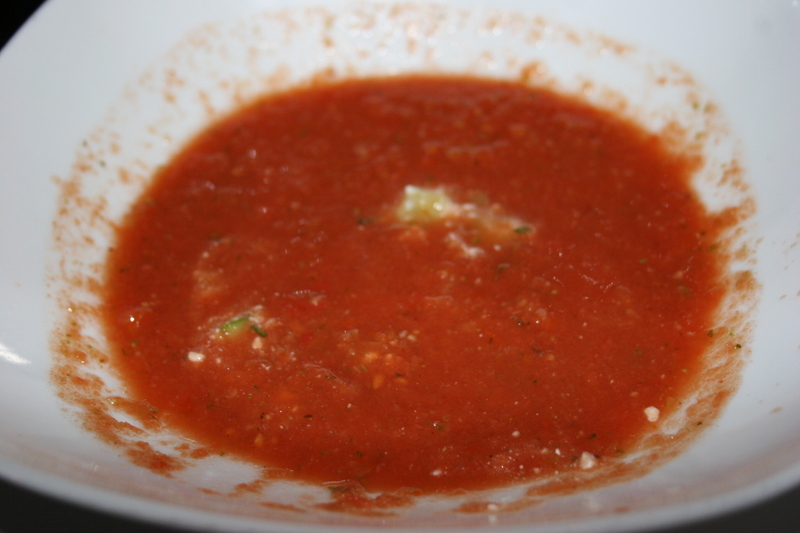 I certainly was not counting on what tasted like cold tomato soup that someone drizzled some watermelon into. I am not blaming Marly’s. This one was entirely my fault. We both fared much better with our choice of entrees. 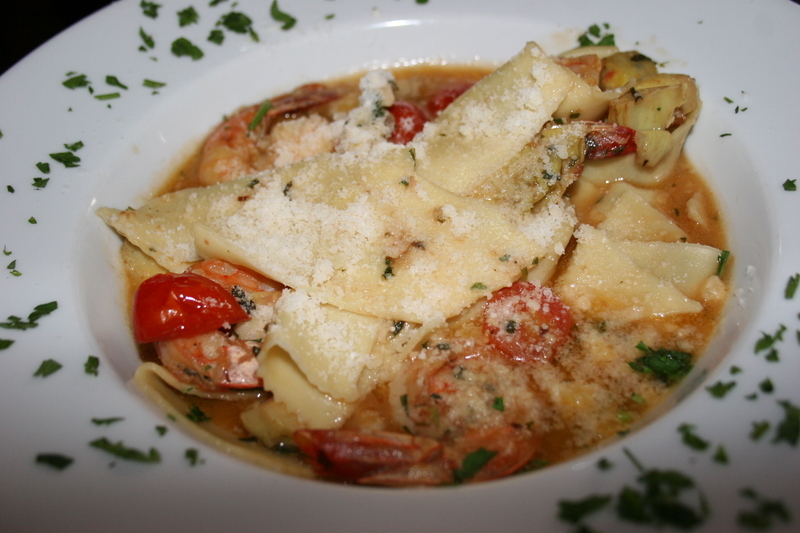 Gerry enjoys shrimp and he went right to his first choice the Shrimp Reggiano – served with fresh torn pasta sauteed with cherry tomatoes, and artichoke hearts served in a fresh basil, reggiano-seafood sauce – 23. He shared a small portion with me and the flavors were excellent. It really was a nice combination that teased the taste buds. I could have chosen several different eye-catching items from the menu as there were some terrific fish entrees and plenty of dishes that came served over various risottos. In the end, I selected the Marly’s “Cheese steak”- Pan-seared Filet mignon, topped with a Roquefort-walnut crust served with the potato of the day – 29. 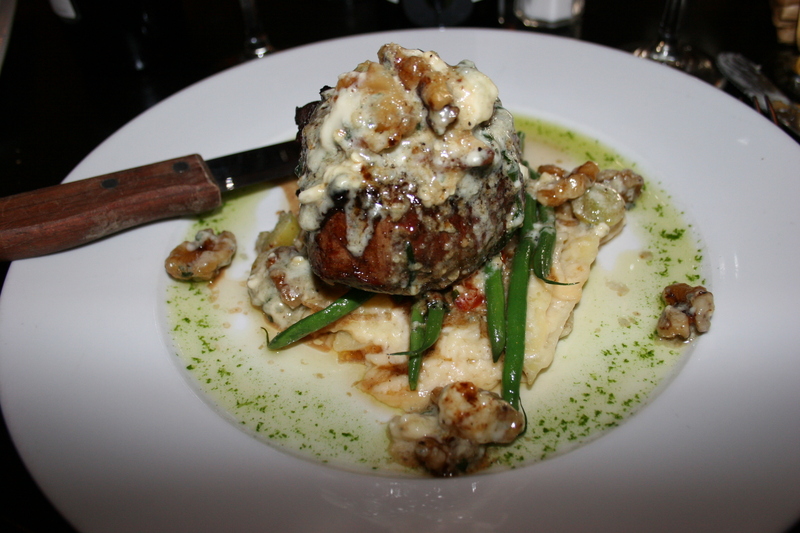 The Roquefort topping went perfect with the flavorful potatoes and the filet was nicely done and super-tasty. If I could add a minor gripe they could have removed the walnuts and had no resistance from me. The dish was perfect with the full-bodied wines and I thoroughly enjoyed the dinner, the drinks and the conversation. Marly’s proved to be another really good Phoenixville BYOB.